Rise of Ragnarok – Asunder, the mobile MMOARPG opens pre-registration! 26th January, 2018–Video game publisher GTarcade announced that their new project Rise of Ragnarok - Asunder, an unparalleled mythological MMOARPG for Android and iOS, is now open for pre-registration. Rise of Ragnarok - Asunder is an action-packed, fantasy MMOARPG that lets players adventure through mystical lands and engage in a large variety of PVE and PVP gameplay. Players can customize their character with hundreds of equipment items and multiple ways of progression to become an immortal to save the world. There is strength in numbers! – When the number of pre-registered users reaches specific milestones, corresponding rewards will be unlocked for all players. The rewards will be sent directly through in-game mail after the game officially launches. Completing the gem collecting mini-game on the pre-registration site can yield an extra exclusive gift pack and a limited-edition title “Legendary Valor”. 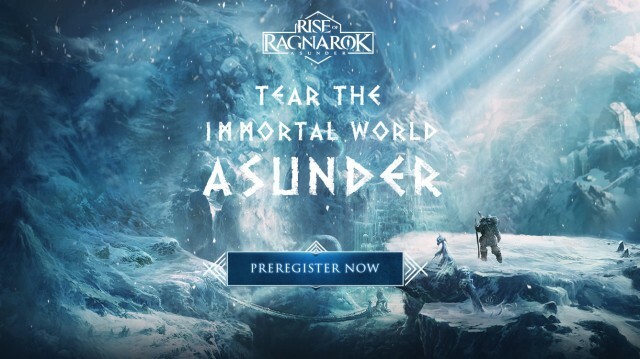 The official site of Rise of Ragnarok - Asunder is now open for pre-registration. The epic journey in thisunparalleled mythological MMOARPG of the next generation is about to begin. The mysterious story originated from the black waters of the lifeless ocean of Ginnungagap, surrounded by silence and darkness. Yet slowly as the Oran Mor, the great melody of the primordial god, played across its surface the waters of the ocean began to part, becoming boiling hot and freezing cold and thus forming two realms. Hel opened the gateways between the realms and her forces fell on Midgard. All realms mobilized their forces in an almighty first battle. In this battle, Loki and Odin fought bitterly, until at last Odin fell. He appeared to die on the battlefield, but was entrapped instead. Now players must face many hardships to free Odin from his prison. To do this, players have to battle through many enemies across the famous realms, collecting runes that enhance their power and class so they can challenge the mighty denizens who control the most powerful runes. The fully detailed fantasy world is based on real world places and mythological locations, including the Qin Dynasty, Ancient Egypt, the Khmer Empire, Mount Olympus, Atlantis, Mayan jungles and more.